This strange looking species can be found in many damp areas and open drains around the boundary of the golf course. It is especially noticeable on the banks of the open drain at the boundary fence that runs alongside the 7th fairway. It is a non-flowering, seedless, plant. Not having flowers or seeds, it reproduces by microscopic spores rather than seeds and is found throughout parts of Europe, Asia, the Middle East, and North America. This non-flowering category of plants includes some very familiar life-forms such as ferns and mosses. 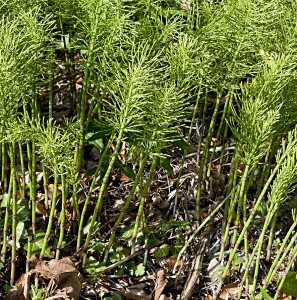 Horsetail is descended from huge, tree-like, primitive plants that thrived 400 million years ago during the Paleozoic era – as a result it is often referred to as a living fossil. . The plant is a perennial with erect shoots (up to 0.5 m tall) that look like asparagus at first. Later, as it produces side branches, it assumes the appearance of a bottle brush – in fact “Bottle brush” is one of the common names of this species. The aboveground parts of Field Horsetail are used for medicinal purposes, a practice dating back to ancient Roman and Greek medicine. The plant contains silicon, which plays a role in strengthening bone. For that reason, it is sometimes suggested as a treatment for osteoporosis. It is also used as a diuretic. The plant is toxic to sheep, cattle and horses being poisonous in both the green state and dried in hay. It also appears to be able to resist the effects of nearly all herbicides that have been used at Castlewarden.